"Gender equality must be addressed in its own right and as a catalyst of progress across the SDGs," said ADB Vice-President for Knowledge Management and Sustainable Development Mr. Bambang Susantono. "The findings and recommendations in the report provides an opportunity to overcome the deeply entrenched gender inequality through transformative change and support progress towards sustainable development in all dimensions: economic, social, and environmental." "Data and evidence can bring a deeper understanding of how gender discrimination and power relations exclude women (or men) from certain rights, institutions, and privileges. Overcoming deeply entrenched gender inequalities would not just improve the lives of women and girls. It would transform the world, empowering everyone to realize their full potential and live a life of dignity," said Regional Director a.i. of UN Women for Asia and the Pacific Ms. Anna-Karin Jatfors. "This publication provides invaluable evidence to support the effort to make gender equality and sustainable development a reality for all." 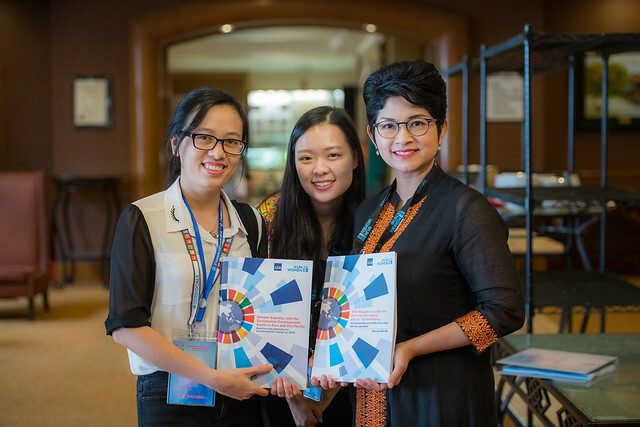 The report identifies the lack of gender data to track progress in countries in Asia and the Pacific, with some lacking data on 41 % or 36 of the 85 gender-related SDG indicators. It underscores the urgency to improve the production and use of gender statistics for implementing and monitoring the SDGs at the country level. The report uses available data in 57 countries and territories, helping to establish a baseline for governments to monitor and focus efforts on the gender equality commitments where they are most lagging. The report shows that, while Asia and the Pacific has made progress in some areas of gender equality, there remains significant inequality for women and girls. For instance, as many as one in two women has experienced physical and/or sexual violence from an intimate partner in the past 12 months. Women and girls also spend as much as 11 times more of their day than men and boys on unpaid care and domestic work. Some countries in the region, meanwhile, have the highest incidence of "missing women" in the world due to discriminatory practice which favors sons, while progress on reducing maternal mortality rate has also been uneven.